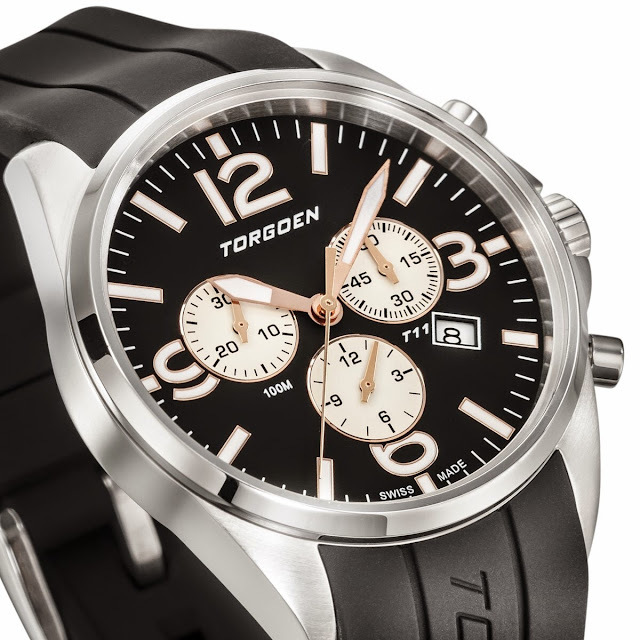 Torgoen has added a new line to its stable of Swiss made aviation watches. The T11 WASP is the company's first women's watch. Named in honor of the Women's Airforce Service Pilots, the first American women to fly military aircraft, it takes all the best elements of their men's watches, scales them down, and even improves them a bit. The result is so good, I suspect more than a few of us men will buy one for ourselves. The watch is strikingly similar to our old favorite T16 chronograph. 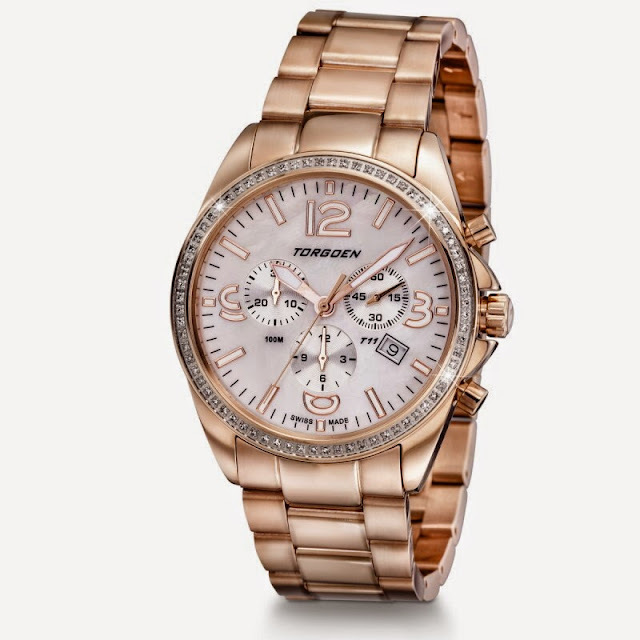 Its polished stainless steel case has the same round shape, small bezel, crown guards, and tapered lugs, but where the men's watch is 45mm across, the women's version is only 41mm. Yes, I know the site says 36mm (and that would have been mighty interesting too) but the dimensions just didn't add up so I double checked, and Torgoen confirmed that particular spec is an error. This means the T11 will appear proportionately as large the men's watch when worn on a typically smaller woman's wrist, without looking exaggerated. It also means that it is the perfect size for many men who may not want an extra large watch. Height is reduced from 14mm to 10mm, which makes it far more shirt cuff friendly and thus a viable option for a workweek watch. Strap options include 22mm silicone, leather, or a stainless steel link bracelet. The silicone is strictly casual, but the bracelet and leather are perfect options for dressier attire. The dial is also familiar, with the bold four-numeral layout and Roman sword hands. The 4 o'clock date window is there too. It gives up nothing to its counterpart in terms of function. 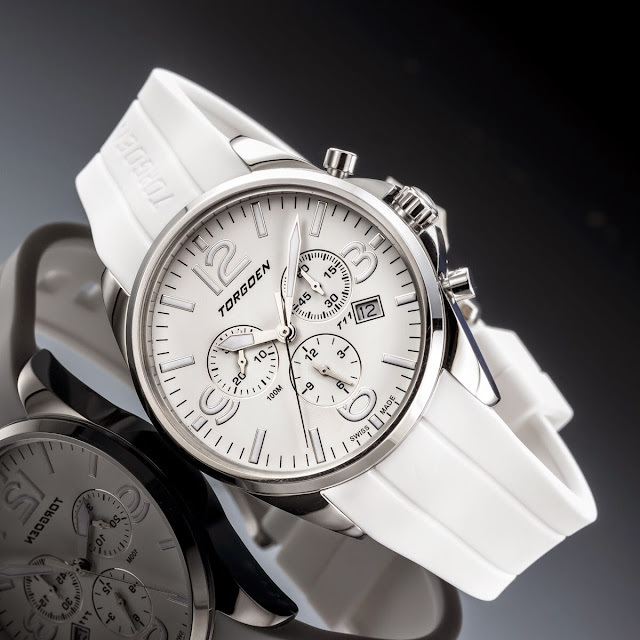 It is water resistant to 100 meters and chronograph functions are the same. The WASP's smaller dimensions mean the three registers (30 minute, 12 hour, and small seconds) crowd the 3, 6, and 9 a bit more, but not so much that the numbers are lost. Peer closer and you will see polished and applied markers instead of the printed ones in the T18. Now it gets really interesting as you are looking through a sapphire crystal, which rectifies my biggest criticism of Torgoen's other offerings. The movement is a Ronda Startech 5030.D, a Swiss made, 13 jewel, gold plated quartz with a long life battery. 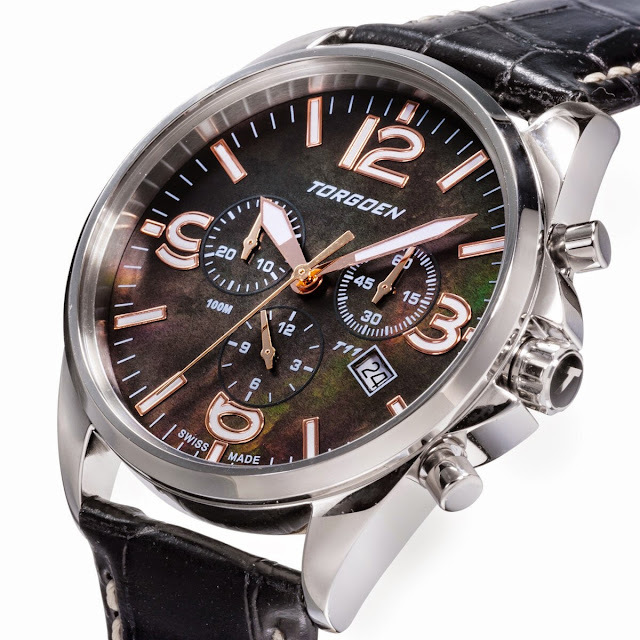 The T11 may have a more feminine appearance than Torgoen's other watches, but not exclusively so. Ok, the rose gold, white Mother-of-Pearl, diamond bezel might be tough for a man to pull off, but the black with white "reverse panda" would be pretty sharp on any wrist, and the silver/white combination has some crossover potential as well. The WASP series runs from $450-490 depending on the model, then jumps to $1,190-1,290 for the diamond versions. I don't know which model Mrs. Time Bum would prefer, but I would wear that reverse panda in a heartbeat. The T11 WASP can be ordered directly from Torgoen.com.